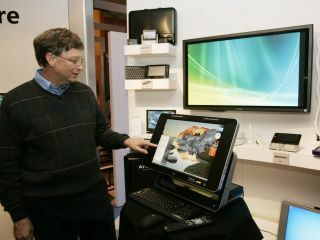 Gates says Vista is "a big, big advance in the Windows platform"
Windows Vista has "received an incredible reception", according to Bill Gates. The Microsoft founder made the comment during a visit to Ottawa, Canada where he was promoting the Bill and Melinda Gates Foundation . "People who sell PCs have seen a very nice lift in their sales. People have come in and wanted to buy Vista," assured Gates. The chairman was responding to questions posed after last week's comments by chief executive Steve Ballmer that analysts predictions for Microsoft's revenue were "overly aggressive". "The reviews have been fantastic. This is a big, big advance in the Windows platform," Gates told Reuters . "It's the world's most used piece of software. Overall, the reliability feedback has been much better than we expected." Gates was speaking at a Canadian news conference to announce £60 million in funding from the Bill and Melinda Gates Foundation to research a vaccine for HIV/AIDS. But despite the good work of the Foundation, several of the assembled journalists were more interested in talking about the world's most-used software instead.